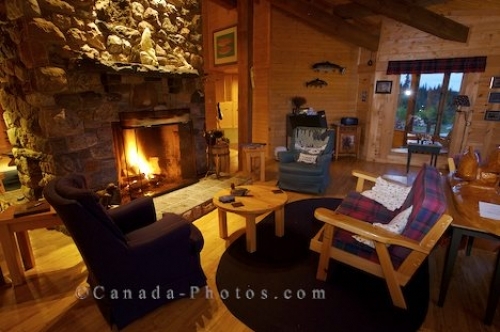 After a chilly day in the river fly fishing or kayaking down the river, enjoy an evening in this beautiful lounge in front of an open fire at the Rifflin Hitch Lodge in Southern Labrador. You have all the comforts of home at this lodge and the wood decor and brick fireplace in the lounge blend in with the wilderness of the area. Lounge room with open fire at the Rifflin'Hitch Lodge in Southern Labrador, Labrador, Canada. Picture of the coziness of the lounge in the comfort of a fire at the Rifflin' Hitch Lodge in Southern Labrador.